I debated finding a guest to write this post on compassion, since it hasn’t always been my strong suit. However, the point of my character training posts are not that we are perfect – by any means – but that we are all on a journey to high character and taking our children with us. In college I went home with my boyfriend and sister to their family’s house. One day, in between trips to the pool, their father gave us all a personality test. I absolutely love a good personality test and this was no different. After tallying the results, I was shocked, except not really, to notice that my Mercy score was nearly 0. In short, I was merciless. I could blame it on my ENTJ personality or I could call it what it was: unsympathetic and judgmental behavior. Throughout the 10 years since then I’ve grown in the area of compassion. Compassion (defined as sympathetic concern for the misfortunes and sufferings of others) grows when we go through difficult situations. Compassion grows when we suffer ourselves. Compassion grows when we become less self-centred and more willing to put others first. 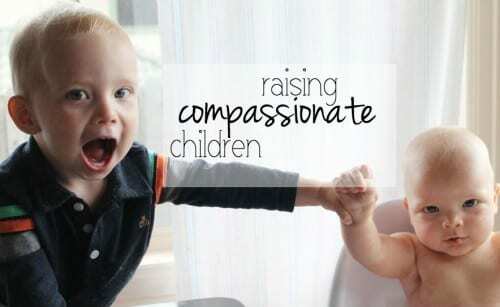 Compassion is something I hope to continue to grow in, and something I hope to instil in our children as well so they will be willing and eager to help others as they grow older. Not in a “it’s my duty to volunteer” way, but in a “I’m moved by compassion, so I act” way. 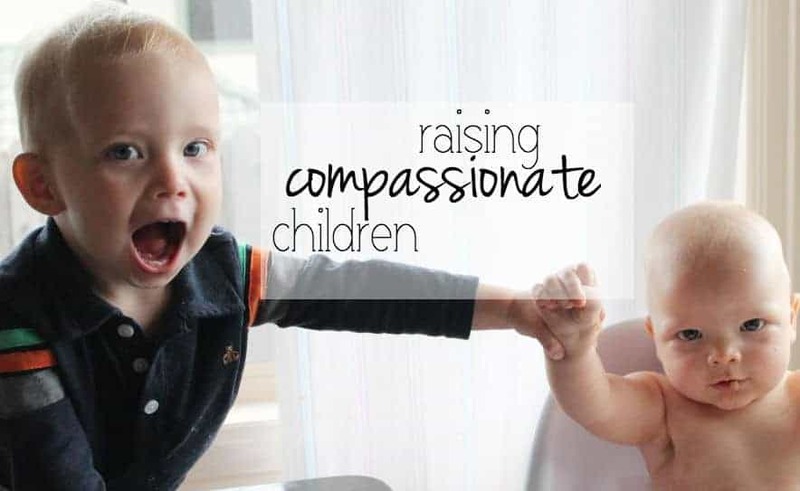 Here are some thoughts on how we can help raise compassionate children. 1. Start with the siblings. Day in and day out you’ll be presented with opportunities to help your children showcase compassion within the family. Now when I say compassion, I don’t mean we need to encourage intense sensitivity with everyone droning on and on which prevents people from becoming appropriately tough and able to cope in society. When one sibling is ill or going through a hard time, we can encourage empathetic and sympathetic behaviour. Of course there will be the normal amount of sibling teasing and playfulness, but we can ensure it doesn’t get truly out of hand, and that when it counts, they are compassionate towards each other in word and deed. 2. Get to know people. The more you meet people outside of your small group, the more you venture outside of your hometown, the more you go outside of your comfort zone, the more compassion you will have. Inside your normal circle of life it may seem that a person without a home is someone too lazy to get a job. A woman from an abusive relationship may just be too “weak” to get out. A young boy with negative attention seeking behavior is just a bad seed. The more you actually get to know people and their stories, the more you will find you don’t know as much as you thought you did. You begin to feel compassion for people who maybe, just maybe, are in bad situations not of their own doing. And you might even graduate to feel compassion like Anne of Green Gables who said really, those who get themselves into trouble probably even deserve more compassion. 3. Serve and love others. It’s sort of like any good thing, the more you do it the more you like it. The saying “it’s better to give than to receive” might be cliche, but that’s because it’s true. The more we give and serve as a family the more our children will become used to helping others. It’s hard to look down in judgment upon others that you are frequently helping with a happy heart. 4. Take advantage of the hard times. I can say unequivocally that the reason I am far more compassionate now than I was when I took that personality test in college is that since then, I’ve suffered. I won’t say I’ve had a life marked with tragedy, okay, but there have been seasons of emotional, physical and mental pain that have very unpleasant. Each time I saw the light at the end of the tunnel during these seasons, I came out more compassionate, less judgmental, and more understanding of others. While this will be a journey our children take on their own, we can call out these things in them. When they are going through hard times, we can ask questions. We can draw parallels, “Remember when so-and-so was having a hard time? I wonder if he felt like this?” We can help them suffer in a way that helps soften them as opposed to harden them. I’ve said it before and I’ll say it a million times more. We need to absolutely eradicate meanness in our homes. I would not suffer a bully at school and I won’t suffer a bully at home. I’m not talking about a little sarcasm and dry humor, that’s simply personality. I’m talking about pure meanness. To me, meanness is just as bad as stealing or lying. Completely prohibited and for which there is no acceptable excuse. I believe that children with kind hearts will be far more compassionate (even if their personalities tend more towards judgment than mercy, like mine). These character posts are never meant to make us feel more pressure to do something, and definitely no guilt for not having done anything. The every day ins and outs of life give us so many opportunities to help our children grow into kind, strong, and capable adults. We don’t have to fabricate situations, we simply have to take advantages of the ones that present themselves.